The May 2017 killing of 18-year-old Andrew Oneschuk and 22-year-old Jeremy Himmelman, members of the neo-Nazi group Atomwaffen Division, shed light on a small and little-known extremist organization since overshadowed by the events in Charlottesville, Virginia. Devon Arthurs, their 18-year-old roommate, shot and killed both men at their Tampa, Florida-area apartment after converting to ultraconservative Salafi Islam. A fourth roommate, Florida National Guard member and the Atomwaffen cell leader, 21-year-old Brandon Russell, then fled with a friend — 20-year-old William Tschantre — before being arrested in Key Largo. Russell, who remains in jail on explosive charges, is a credible threat according to police. Inside the apartment, police found bomb-making materials including fuses, casings and the high-explosive compound HMTD. Inside Russel’s room sat a photo of Oklahoma City bomber Timothy McVeigh. Arthurs, who is facing charges for the murders, accused Russell of planning to “bomb power lines, nuclear reactors and synagogues,” according to the Associated Press. However, the killings did not spell the end for Atomwaffen, and the hate group soon elevated Oneschuk and Himmelman to martyr status. The violence in Charlottesville, where 20-year-old white supremacist James Alex Fields allegedly drove his car into counter-protesters and killed 32-year-old Heather Heyer, has also served as a springboard for the group to spread its propaganda. Atomwaffen, or “Atomic Weapon,” promotes a “leaderless resistance” strategy. It has featured articles on its social media channels critical of the rally for provoking a public backlash, and seems intent on exploiting infighting among the far right to its advantage. 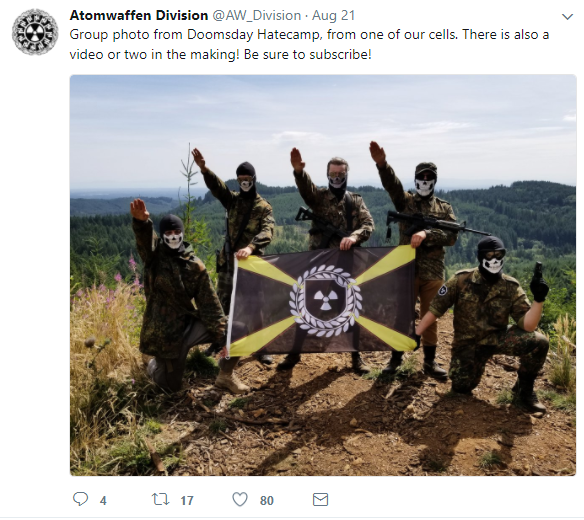 Rather than large rallies and political organizations, Atomwaffen advocates “lone wolf” terrorism, secrecy and paramilitary training. The group’s ideology closely resembles National Action in the United Kingdom, a proscribed terrorist organization. Atomwaffen also emerged from the Iron March forums — the source of several online zines — and its members adorn themselves in skull masks, Flecktarn camouflage and black-and-white badges featuring the radiation hazard symbol. A recurring motif in its social media propaganda are pictures of members hiking in remote areas while carrying firearms. The hate group claims around 40 members in the United States. An Atomwaffen social media posting to Twitter. Atomwaffen’s rhetoric hasn’t matched reality. Despite its radicalism and avoiding the spotlight, the group’s most visible public displays have been sporadic appearances at demonstrations, with members strutting with weapons and flashing Nazi salutes. “Before those incidents and since, Atomwaffen and Iron March devotees have largely contented themselves with intermittently fliering college campus[es], usually under cover of night,” the Southern Poverty Law Center noted in a June 2017 profile of the hate group. Nevertheless, one key source of inspiration from Atomwaffen is Siege by James Mason, a collection of newsletters published as a book in 1992 and marked by an emphasis on violent rebellion, assassination and references to the Provisional Irish Republican Army. 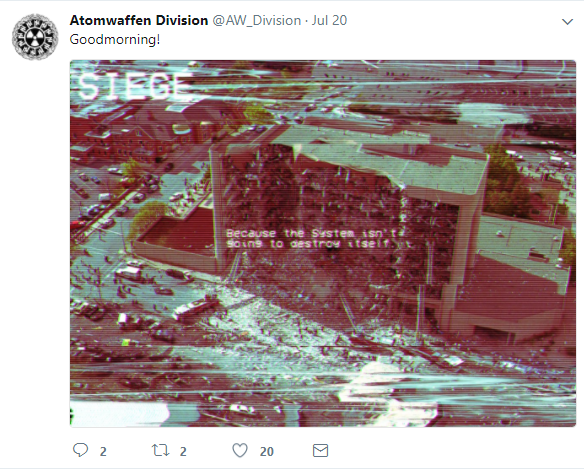 An Atomwaffen social media posting to Twitter referencing the Oklahoma City bombing. Mason was an acolyte of American Nazi Party leader George Lincoln Rockwell in the 1960s, and later founded the Universal Order which idolized Charles Manson as another Adolf Hitler. Atomwaffen generously cites Mason and Siege on its social media channels and recently republished the book. These statements should be treated as serious aspirations, even if the bomb-making materials in Florida were low-tech. But the hate group’s emphasis on secrecy, militancy and unabashed neo-Nazism will likely prove to be an obstacle to white supremacists who had joined organizations which attempted to present a mainstream image. The North American white supremacist organization Identity Evropa, which has hundreds of members, eschews overt neo-Nazi symbolism and encourages its members to dress respectably, an attempt to create ambiguity and lowering — for a time — the social barriers to entry. However, these groups are now vulnerable after Charlottesville, and debates in neo-Nazi forums are trading back-and-forth accusations of excessive and insufficient radicalism. As the infighting continues, Atomwaffen is positioning itself to take advantage with its pitch of diffuse and more radicalized cells. But its extreme rhetoric — even by the standards of its competitors — and secretive structure will likely serve as a hindrance to growing its numbers on the scale of other neo-Nazi groups. This does not necessarily mean Atomwaffen is more dangerous than its rivals on the extreme right, although the advocacy of terrorism should be taken literally. The disagreements the group has with them are over tactics, not end goals.